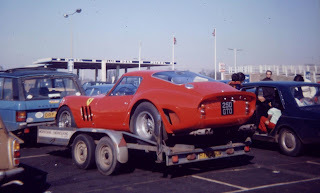 Who knew one day I be featuring a 250 GTO in this blog! :) My dear friend David dug out this old slide recently which was taken with his trusty Kodak Instamatic about March 78 at Watford Gap service station on the M1 of a Singer Gazelle slumming it with some form of Italian exotic with a dented front wing. The Ferrari 250 GTO is actually Nick Mason's car (chassis #3757LM), presumably bought with all the royalties from The Dark Side of the Moon, that is a genuine registration by the way. It's one of three 330GTO's with a 4 liter engine instead of the usual 3 liter, externally identical apart from a bigger bonnet bulge. Can anyone figure out the then market value of this prancing horse (~$12m or so today); also can anyone name the car in the spot to the left of the Ferrari? The rumour was that Nick Mason paid £37,000 in 1978 - prices were rising after early 70s when a couple of tired GTOs apparently sold for £1500 each - but this was still more than the "normal" 250 GTO level in 78 because of rarity of the 330 engined version (which incidentally also has three vents on the front wing instead of the usual two as a distinguishing feature - I only realised this after emailing the photo and info). Gold car on left is Simca 1501 Special estate - slightly more visible in original photo.